My kids were really excited to join their favorite characters in a Gabba Land Dance Party featuring DJ Lance Rock and the gang. They were singing, dancing and shouting with excitement as they enjoyed the newly released Yo Gabba Gabba! Party in a Box! 3-DVD set. There are 12 fun episodes on 3-DVD’s, including The Dancey Dance Bunch!, Birthday Boogie! and Clubhouse. It features talented celebrity guests such as Erykah Badu, The Ting Tings, and Elijah Wood. Yo Gabba Gabba! always gets my children moving, including my normally shy three year old. I couldn’t believe my eyes but they even got their dad to dance along with them the “Dance” episode. With almost five hours of Yo Gabba Gabba! fun this collection would be a fantastic idea for summer activities……let the party begin! Yo Gabba Gabba! is a widely popular show on Nickelodeon™ for young children. Yo Gabba Gabba! Party in a Box! is releasing on DVD on July 12th, 2011. You can purchase Yo Gabba Gabba! 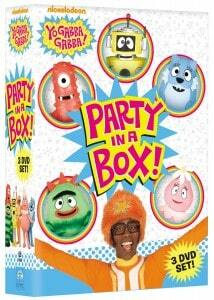 Party in a Box!, 3-DVD collection for only $17.99 by visiting the Nickelodeon website shop. My daughter LOVES Yo Gabba Gabba! 🙂 This might make a good birthday gift!